telling the other person you are aware of 1 & 2. Even for those who excel at this attribute, it is easy to lose sight of empathy in daily interactions. Leaders swim amid a sea of data and emotions, sorting through it all with their own filters and biases. When they are not mindful of empathy, opportunities to build relationships are lost and relationships may even be damaged. 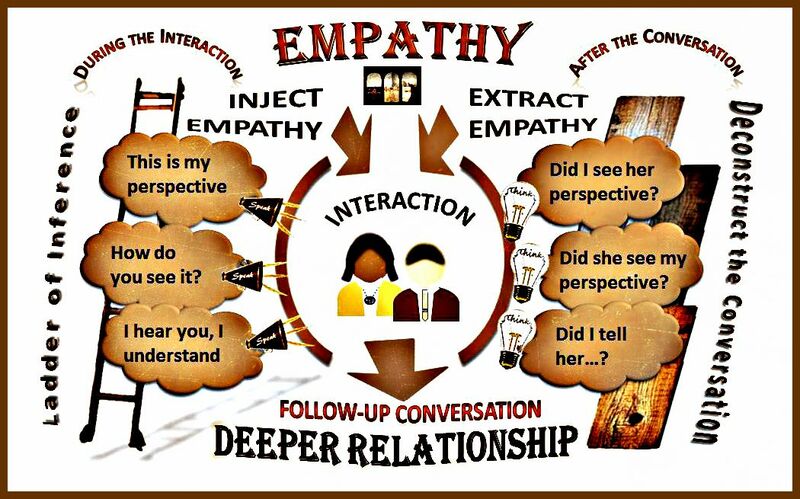 If you build empathy into your interactions, then you will establish trusting relationships. We have found 2 techniques helpful with empathy: The Ladder of Inference and Deconstructing Conversations. 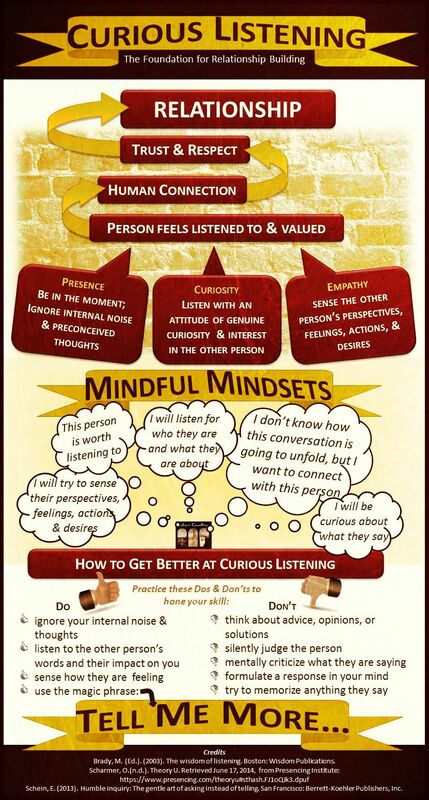 What will practicing empathy get you? How are your professional relationships working for you? What would happen if you built deeper trust into your relationships? Goleman, D. (2013, December). The Focused Leader: How Effective Executives Direct their Own – and their Organization’s – Attention. Harvard Business Review. We cannot underestimate the ‘value of being valued.’ Saying thank you strengthens the bonds between people and re-emphasizes the personal relationship. But a thank you can be even more powerful if it contains the language of ongoing regard. Whether written or spoken it can be transformative for both the sender and receiver. Not only does ongoing regard make both parties feel good, it provides a deeper understanding of the behavior or action being recognized. That recognition is apt to inspire more of that same behavior in the future. If you make another person feel valued, then they are more likely to support you and your work. Be Specific. Describe the precise action you are thanking them for and not personal attributes like generous, helpful, and hard-working. Why do I want to thank this person? What service/skill/behavior did they exhibit? How did their action impact my goals and commitments? 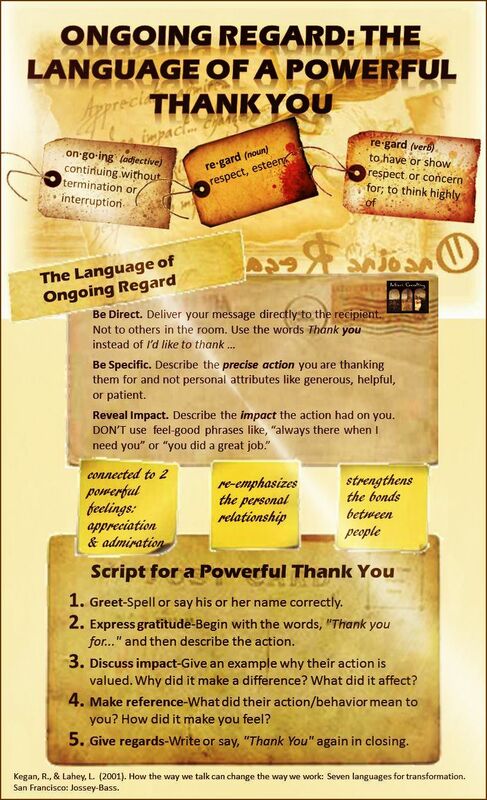 Use the following 5 steps as a script to keep your thank you short and powerful. Greet. Spell or say his or her name correctly. Express gratitude. Start with the words, “Thank you for…” naming the action/behavior you are thanking them for. Discuss impact. Describe a positive impact their action/behavior had. Make reference. What did their action/behavior mean to you? How did it make you feel? Give regards. Write or say, “Thank You” again in closing. Avoid the just writing trap. You are not “just writing to say”– that’s stating the obvious. Don’t share unrelated news. This isn’t the time. This is exclusively about thanking someone for their actions or recognizing their behaviors. How is ‘making your employees feel valued’ working for you? What might happen if you start giving unexpected ongoing regard messages? How might people feel if you regularly tell them the positive impact of their actions? 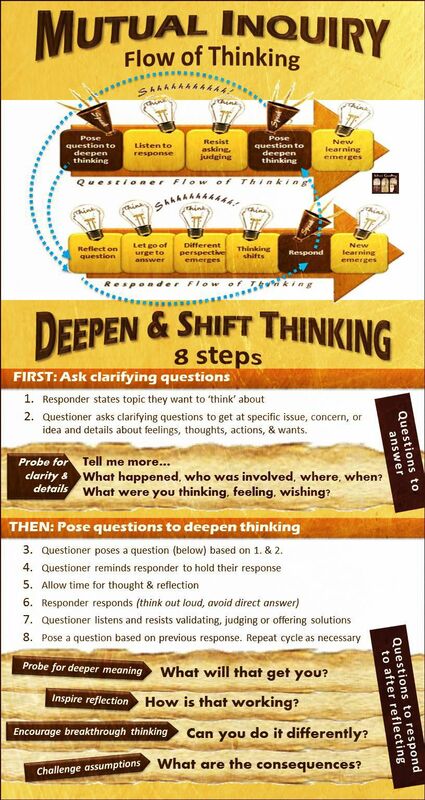 Posing questions to deepen thinking is a valuable leadership practice. It is one of the most powerful ways to help others shift their thinking and see new perspectives. It is an art and skill that can be mastered with practice. If you pose reflective questions and encourage the other person to pause and think before responding, then you will both begin to shift your thinking and uncover new perspectives. Questions to deepen thinking are not meant to be “asked” and “answered.” They are designed to be “posed” and “responded to.” The dynamic of posing a question that is 1) not leading, diagnostic, or challenging and 2) not required to be answered; leads to deeper thinking, automatically. “Asking”a question implies that you are requesting information or an answer. “Posing” a question, on the other hand, introduces a thought for consideration. Derived from the Latin for pause, posing a question sets the tone for introspection and allows the other person to reflect. Think of a response as “thinking out loud.” A response doesn’t require an answer or a solution. It is simply uttering something in reply as a means to continue the thought process and the conversational exchange. Have you ever intentionally asked a question that you did not want an answer to? Have you ever resisted the urge to answer a question to allow time for reflecting? When instructed to hold an answer for a period of time, how many times does your response change in your head? Block, P. (2008). Community: The structure of belonging. San Francisco: Berrett-KoehlerPublishers, Inc.